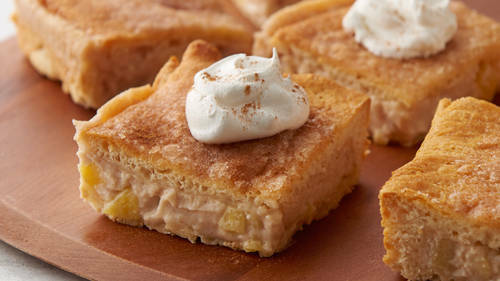 Successfully saved Apple-Cinnamon Cheesecake Bars to your Calendar. You can also save the ingredients to your Grocery List. Creamy cheesecake filling gets mixed with chopped apples and nestled between two buttery crescent layers to make the best dessert bar you’ll try this fall. And the crazy delicious apple-cinnamon sugar topping takes it over the top in the best way possible. Trust us, you’re going to want to make these bars more than once!